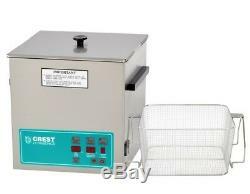 Crest POWERSONIC 3.25 / 12.3lt Gal Digital Ultrasonic Cleaner w/Heat, Timer and Power Tracking, 45kHz Sweep, Includes Basket P1100D-45. Here is the all new Crest POWERSONIC with stainless steel tank that is more durable against overheat. For over 30 years, Crest Ultrasonics Corp. Has been a leader in the precision ultrasonic cleaning industry. Our ultrasonic technology has been used successfully in both aqueous and solvent systems, which serve a wide variety of cleaning applications from rugged industrial to critically precise. That same high performance technology has been transferred to our new line of Powersonic Tabletop cleaners, which provide significant industrial strength and quality at a tabletop price. POWERSONIC CLEANERS WITH CERAMICALLY ENHANCED TRANSDUCER TECHNOLOGY. Powersonic Tabletops clean even the smallest spaces that are inaccessible to normal cleaning tools for use in almost all industries. Laboratory (mixing, cell disruption, homogenization). Electronics solder and flux residues on circuit boards and. Air and filter technology electrostatic air filters, oil filters. Respirator masks, air conditioner parts, valves. Mechanical engineering (machinery parts, valves, assemblies). Food and beverage (valves, injectors and extrusion dies). Body shops (nozzle and coating holders, parts and tools). Homogeneous sound field, energy distribution, and prevention of standing waves using frequency modulation (sweep). 45 kHz and 132 kHz frequencies provide precision cleaning and rinsing options. Drain valve assembly available for tank capacities of 2.5 gallons and higher. Deep-drawn stainless steel cleaning tank with rounded corners for easy cleaning. Intrinsically safe heater with dry-run protection. Tank capacity from 0.75gal to 7 gallons. Digital power control of the ultrasonic generator provides consistent cleaning results regardless of tank temperature. Digital display of temperature, ultrasonic power and cleaning time. Adjustable cleaning time or continuous operation via digital display. Adjustable bath temperature of 20-80°C with digital display. Adjustable ultrasonic power in nine steps. This feature enables an optimal adjustment of the ultrasonic energy to the parts being cleaned. Degas function allows a variety of consistent sample prep applications. Crest Powersonic Benchtop Ultrasonic Cleaner Comparison Table. (L x W x H). 9.5 x 5.25 x 4. 242 x 134 x 100mm. Digital Timer + Heat + Power Control. 9.5 x 5.25 x 6. 242 x 134 x 152mm. 11.75 x 6 x 6. 297 x 152 x 152mm. 11.75 x 9.5 x 8. 297 x 242 x 200mm. 19.5 x 5.25 x 6. 495 x 134 x 150mm. 19.5 x 11.75 x 6. 495 x 297 x 150mm. 19.5 x 11.75 x 8. 495 x 297 x 200mm. All units come standard with stainless steel cover. Our Valuable Customers, Please Read! We encourage our customers to ask any product questions or make counteroffers to our listings. We assure you that your questions and counteroffers will be responded pretty quickly. We will do our best to fulfill your request. Please read the description and the specification of the product carefully before placing order. We will reply your questions as quickly as possible. We are limited in the way we can present items that have these options, so please take note of the specific product code and model number being advertised. So please do not leave negative or neutral feedback without contacting us to resolve your issue. Thank you for your consideration. Your feedback will automatically be left as soon as we receive ours. We appreciate your business and look forward to seeing you as a repeat customer. Food and Drug Administration and state and local regulatory agencies. The item "Crest POWERSONIC 3.25 Gal Digital Ultrasonic Cleaner WithBasket, P1100D-45" is in sale since Wednesday, August 8, 2018. This item is in the category "Business & Industrial\Healthcare, Lab & Dental\Medical & Lab Equipment, Devices\Other Medical & Lab Equipment". The seller is "getmedonline" and is located in Medford, New York.